It's Jaymie here and I wanted to share a card that I made. 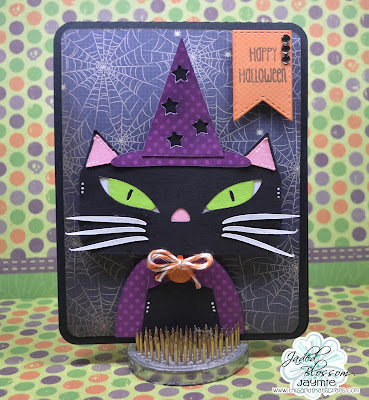 This cute black cat is a NEW card kit file from SVG Cutting Files. I love this file because it's fast and easy and is really cute! This file is being released this FRIDAY! Hope you enjoyed my card today, have a great week! Well I hope you enjoyed my treat box today, thanks for stopping by! such a cute card, Jaymie!! Freaky Kitty, I love it.